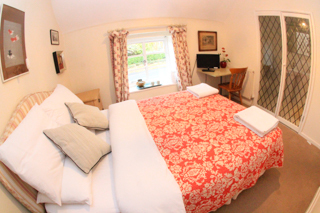 Well equipped with flat screen TVs, broadband and coffee/tea making facilities our four charming bedrooms are a stylish mix of country house style antiques and vintage furnishings. 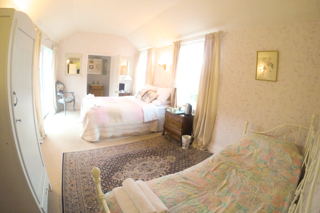 A pretty country chintz room overlooking Cotswold cottages. Double bed and bathroom with large shower. 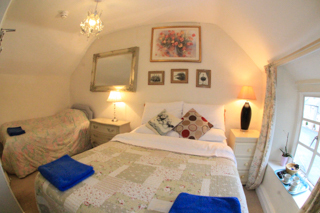 A spacious room with views across the village scene, a 5ft double bathroom and en-suite with both bath and shower. An extra single bed makes this an ideal room for a couple and child. A light, airy family room with a 5ft double. Sun streams in through the two windows onto the pretty blossom wallpaper. A day bed can be made up into two 3ft single beds. Bathroom with large shower. 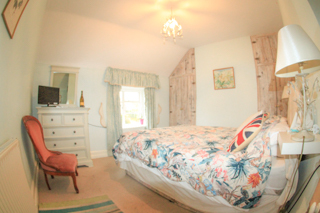 A pretty pale blue room with double bed be overlooking the village high street. Generous bright modern bathroom with bath and overhead shower. Our room rates include breakfast. Tuck into a hearty breakfast of local farm produce or we offer lighter alternatives, if you prefer. 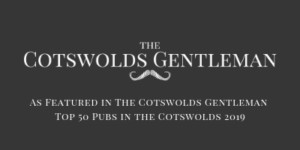 To book please call us on 01386 725020 or use the booking form below.